This final rule revises and updates the hazardous waste generator regulations. This rule is designed to make regulations easier to understand and to provide greater flexibility and explains how hazardous waste is managed in order to fit today's business activities. The revisions are also designed to protect the public by improving facility safety as it relates to hazardous waste generation and management. Further the rule improves the capabilities of the emergency responders by improving risk communication. The new rule responds to feedback from the regulatory community such as the federal regulators who implement the requirements, state agencies that also implemented the requirements and other stakeholders. All of this represents a significant investment in time and energy that resulted in many challenges in the EPA hazardous waste generator program. The new biennial reporting requirements, to be satisfied on 1 March 2018 will be addressed as part of this webinar. 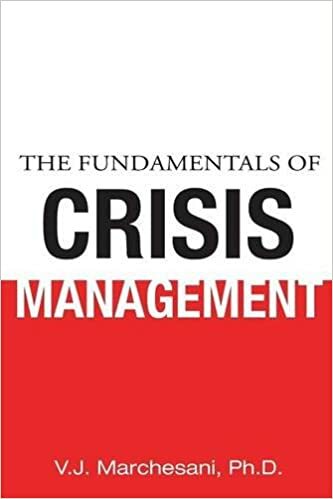 A must-read for every member of a company or organization, whatever its size, from the worker who puts the lug nuts, to the big shot who makes the most important decisions, The Fundamentals of Crisis Management may prove to be a perfect guide to crisis management in this constantly changing world. You should attend this webinar if your facility is in any way connected with the generation, treatment, storage, disposal or transport of hazardous waste. If your facility generates hazardous waste you should be very familiar with the existing rule and what it takes to maintain compliance. This webinar will present information on the changes to the rule; and how your facility will be affected.